The Child sings in a choir, which means I shuttle her to rehearsals as well as concerts. The first year she sang with the choir – about three years ago – she had a fall concert in the Ravenna neighborhood of Seattle, which I don’t know well. She had to be delivered for practice and then the concert followed two hours later. Basically, this left The Departed and me with two hours to kill in an unfamiliar neighborhood; this being Seattle, we decided a cup of coffee was in order. He suggested we go get some coffee at Starbucks. We walked from the concert hall toward an area where I thought we’d passed some shops on the way. After a couple of blocks, we saw some small shops, and crossed the street to check them out. One of them was a coffee shop with a funky vibe: mismatched chairs and a handwritten sign announcing free wifi within. Hipster types were scattered about with lattes and laptops. We both looked in the window. We can get coffee here, I said. Shall we try it? He said nothing, and simply kept walking in the same direction as before. After a couple more blocks, I asked what we were looking for. You said there was a Starbucks up this way, he said. It wasn’t what I said, but it being Seattle, it was probably a correct statement, so I kept silent and we kept walking. Finally we saw a Starbucks sign, and sure enough, there was one: inside a supermarket. With no seats. The kind of Starbucks where you grab your latte on the way back out to your car. Not the kind where you sit and relax and have a nice chat over a cup of coffee because you have two hours to kill. Well, he said, let’s get a cup of coffee. There’s no place to sit, I said. Well, there aren’t any other Starbucks around here, he said. What was wrong with the little coffee place we passed? I demanded. We didn’t pass any coffee place, he said firmly. Not only did we pass it, I told him, you looked in the window. I think I must be mistaken because he’s adamant: We passed no coffee shop. But we walk back toward the concert hall because I refuse to stand in a supermarket with a latte in my hand. He doesn’t understand that the acquisition of a cup of coffee is not the actual point of getting a cup of coffee. We pass the coffee shop again on the way back. This coffee shop, I tell him. What was wrong with this? There are seats and actual ceramic cups. It wasn’t here before, he says. It was here and you looked in the window, I say. I see a bit of a light flicker but it isn’t a light of remembrance, it’s a light of realization that his version of events is utterly implausible. Nobody built a coffee shop and filled it with hipsters and wifi in the last five minutes. I don’t know how that happened, he said. Why didn’t you say something instead of walking around looking for Starbucks? I did, I tell him, but then I turn my attention to the free wifi and my iPad. The coffee here may be amazing, but it is no longer possible for me to enjoy it. I mention all of this because on the first weekend of the New Year, The Child announced that her resolution was to do more bike riding, meaning I got to load up the bikes and drive us to the bike trail. I’m fine with this as the weather is halfway decent and I’ve been itching to get out and enjoy it. Once I remember how to load the bikes on the rack and recover from nearly putting the handlebar through my rear window, we go off riding. It’s a great ride, a bit chilly but we spot a hawk high in the bare tree branches looking for his lunch. The trail is fairly empty so it’s a nice peaceful ride: us, the hawk, some ducks here and there, and the occasional other cycler or dog walker. We go as far as we can north, then turn and backtrack to my car. As we head south, we pass The Departed, cycling north. I look right in his face. We are the only people around. He does not see me, nor the child whose stepfather he was for eight years. He does not see anything he did not expect to see. Which explains why he never really saw me, either. 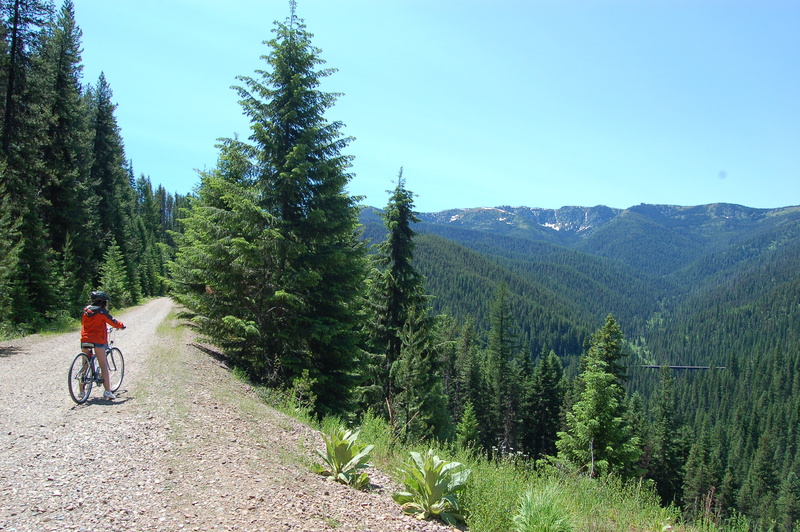 The original point of going to Idaho – and the reason I drove for an entire day with two bikes nervously strapped to my car – was to take a bike ride on The Trail of the Hiawatha. I’d had visions of training rides all spring, culminating in this summer ride along 17 miles of mountainous railroad track converted to bike trail. In fact, I’ve gotten very little bike riding in, and none whatsoever in the month immediately before the trip. I feel silly schlepping two bikes for a day and then not riding them, but when the day of the bike trip arrives, I realize, I’m going to feel sillier if I have to be airlifted out of there, or perhaps pulled out on a dogsled. I ask the waitress. She tells me, honey, little kids do that trail. It’s not hard. Have you ever done it? I ask. No, she says. But little kids do it. You can do it. I load the bikes back on the car, and realize the reason they’ve been making me so nervous: one of the straps on the bike rack was not tightened properly. I’d managed to tighten every strap multiple times and miss that strap, every single time. We drive to the trailhead and I manage to spend the entire drive looking out the front window. Okay, maybe I glanced in the rear mirror once or twice. We buy box lunches and bottled water and a backpack to put them in. We buy trail passes and shuttle bus passes for the return trip. Someone helpfully suggests that we need headlamps for our bikes, too, so I rent one for each of us. Nobody seems to care that we are unprepared; instead, they just tell us what we need and show us where to get it. We get to the trailhead, and start to bike through a two-mile long railroad tunnel. It’s completely dark, and quite cold. Water drips on us; it feels like the mine. But we have jackets and we’re moving, so we’re not too cold, and we can hear people ahead of us singing Thriller. It’s creepy in a fun way. We go slowly and gradually our eyes adjust. Before we know it, we’re at the end of the tunnel and biking on a gravel path. We don’t have to pedal much, because the trail starts at the top of a mountain and ends at the bottom: It’s all downhill. We go across trestle bridges and through more tunnels. We sing zombie songs in the tunnels, and say hello to the intrepid uphill bikers who occasionally pass us. They say hello back. We take group pictures for people, and they take pictures for us. As we neared the end, I realized: If The Departed had not left, I would never have gone to the Seattle Bike Expo and chatted with the man who gave me a bike map of the Idaho Panhandle. I would not have planned a road trip, because I could have afforded much more. I would not have strapped bikes to the back of my car, because it can’t be done in my kind of car. Do you see that little bridge off to the right? Yeah, we biked that. We hit the road a bit late. I was aiming for nine; we left at eleven. I’m pretty sure the garage door was down when we left. There are two garage doors, and I’m positive one of them was down – the spring broke a couple of months ago and it hasn’t been raised since. The other one? I’m pretty sure. I spend much of the ride looking out the rear view mirror at the bikes I have strapped to the back of the car in the bike rack that I mounted all by myself. I replaced my marital suburban assault vehicle with a zippy little used Mini – and then had to get a new bike rack for it because I discovered the universal bike rack left behind by The Departed was missing some key parts that would allow me to mount it to my Mini without ripping the rear door off. This new rack, which the guy at the bike rack store told me he “wouldn’t accept any responsibility for resulting damage” for as he tried to sell me $1,000 worth of custom-installed hitch-mounted bike-rackery. The bikes wobble a lot. I stare at them and will them to stay attached to my car. Every so often, I pull off the road and tighten the straps. Then I get back on the road and go a little slow. Everyone passes me. I want to be excited about the ever-increasing speed limits in my zippy little car, but instead I am fixated on the bikes, mounted on the back. Possibly damaging it. Probably about to come flying off and cause an accident. I discover I am starving. The Child – too afraid to speak for fear of breaking my concentration, which she has realized is the only thing keeping the bikes on the back of the car – agrees. She is starving too. We’ve been on the road for three hours. She never had breakfast. I’m a menace to other drivers, and a bad mother too. I pull off at a town called Ritzville. We’ll have a fancy meal, I tell the child. Ritzy. That’s what Ritzy means. There’s a sign for the Top Hat Motel. I’m thinking, Fred Astaire probably owned that place once. There’s another sign, for a historic district. This is what I came for: Smallville. We drive by what seems to be a bike swap. A guy in a wifebeater is selling puppies. A gap toothed child stares open-mouthed at our car as we pass. Mommy, I don’t think there is any food here, says The Child. There must be, I say. I’m thinking, if I can keep bikes attached to my car by sheer force of will, surely I can make food appear when I need it – preferably a 1940s Luncheonette counter with chrome trim. It must be here somewhere. Mommy, I think they film Hoarders here. I watch the bikes sway from side to side as I make a u-turn and we head back out of town. A small bird-like thing races in front of me in the road. A quail! shrieks the child. You sure you don’t want to eat here? I ask. They have quail. It’s a delicacy. She glares: I don’t eat quail. That’s meat. Not that quail, I think. I wanted Fred Astaire in Holiday Inn, but I’m pulling up to a truck stop. I don’t eat burgers, says The Child. I bet they have grilled cheese, I tell her. We’ll tell them to hold the burger. We sit down at a table in a place that was last decorated during the Johnson Administration. The child orders fish and chips, which makes me nervous. We’re pretty far from both a body of water and a major hospital. I order the safest thing I can think of, a burger and onion rings. They are the best onion rings I’ve ever eaten. Mommy, my fish is really fresh, says The Child. Please tip him extra. We are passed by a car with Illinois plates, and immediately after, passed by a car with Wisconsin plates. Yo, my Midwestern peeps! Peace out! Shrieks The Child. I turn on my 1970’s disco playlist and we sing along. We seat dance to Night Fever. We wave arms to YMCA. We thank ABBA for the music. In Spokane, we pass Thor Street, immediately followed by Freya Street. We are bitterly disappointed not to find Valhalla Avenue. We vow to return and quest for it. We cross the border, and somehow, everything becomes … beautiful. It looks like Washington, says The Child. No, it looks different, I tell her. The trees are different. No they’re not, she says. If you had even a basic knowledge of trees, you’d know that. Well, I say, fortunately I am unburdened by knowledge of trees or other flora. Isn’t it pretty? They are but you’re still wrong. And then finally, we pull off the freeway and into downtown Wallace. 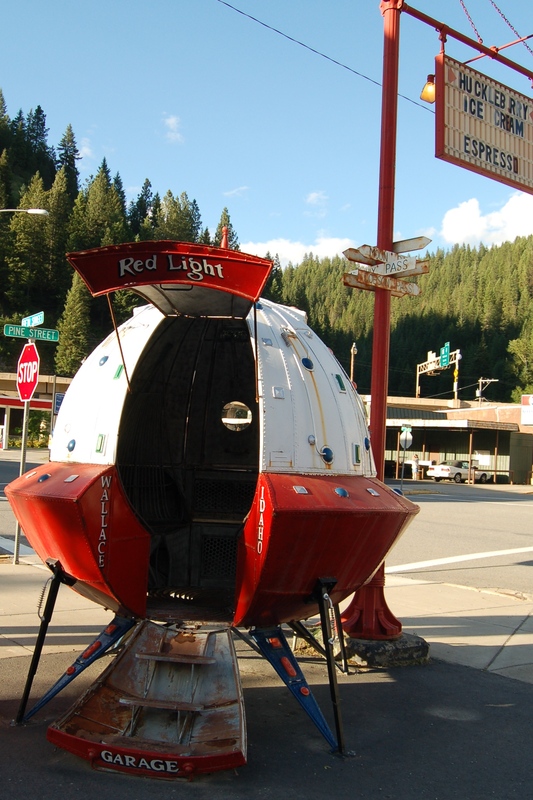 We have no trouble finding our motel: it’s the one with the spaceship parked in front of it. It was last decorated during the Eisenhower Administration. We check in, and go to the diner next door where we order dinner: a double scoop ice cream cone and a root beer float. We eat them on the spaceship. Today I learned: You can go home again, if you know where to look.